Alaska's Situk River provides fall and spring steelhead action for those ready to brave the elements. Both fall and spring steelhead runs are present for fishing. Many streams in Southeast Alaska contain runs of steelhead. But with the topography of the area being mostly islands and remote coastal mainland, it can be difficult to reach most of these fisheries. 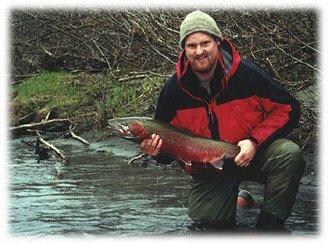 One of the most popular fishing areas containing several streams with steelhead runs is at Yakutat. The Situk River is well-known and well-publicized in magazines and tv shows for good reason. It contains both fall and spring runs and therefore provides the most diverse opportunity to fish for these strong fighting fish.